The other day, Jalna Yoghurt was on sale. 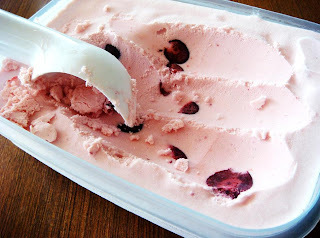 Being thick and creamy, it's especially good for making frozen yoghurt. 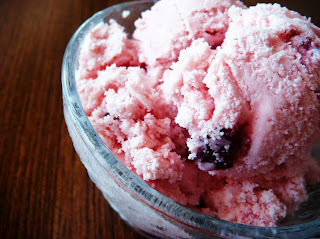 Having some frozen cherries on hand also, I threw them together into my ice-cream machine and made vanilla cherry frozen yoghurt! Very simple to make, and healthier than ice-cream! I love those frozen cherries! Freeze ice-cream canister over night or as per your ice-cream machine instructions. Churn until frozen or as specified by your machine. 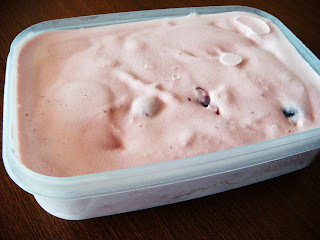 Freeze overnight in a freezer safe container.